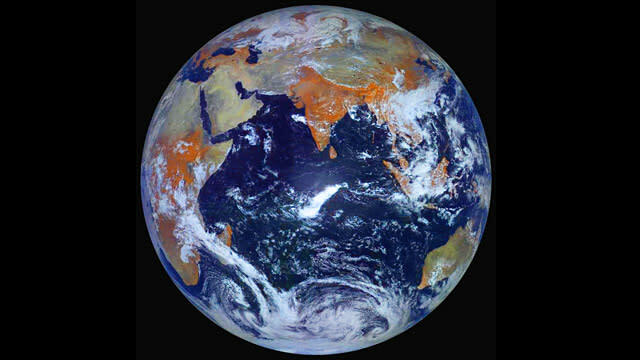 This photo is highest resolution image of earth ever taken and it didn't come from NASA. The image was captured by Russian weather satellite, Electro-L, and unlike NASA's famous " blue marble" photo, it is a single shot, not a composite of different images. The 121 megapixel photo was taken as Electro-L orbited 22,369 miles above the equator, according to Gizmodo. The satellite took a photo every half hour combining four different wavelengths of light, three visible and one infrared. The infrared light is the reason the vegetation appears orange in the image. In the video below, the photos, which were taken in May of 2011, are combined to show the passage of time.